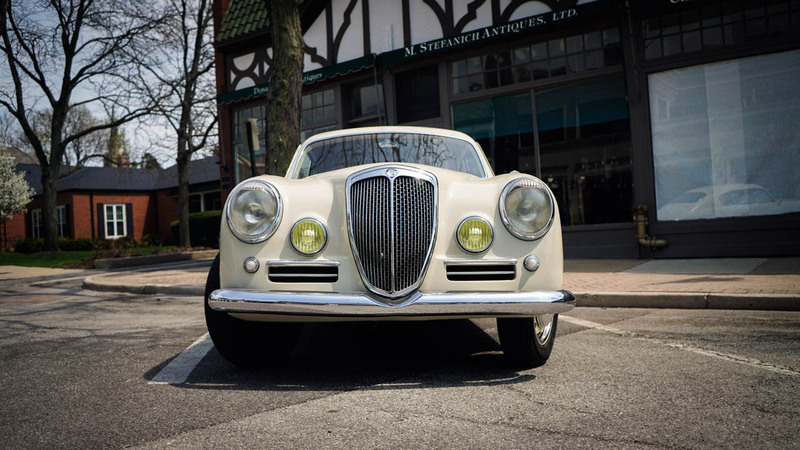 “I’ll get to the shop at 7:30, and let’s be side stands up by 8:00.” Normally I wouldn’t agree to such an early appointment on a Sunday, but when Motoworks founder Johnny Scheff texted me this on Saturday I was in, early morning and all. That’s because the point of our getting together so early on a Sunday was to ride the new 2016 Royal Enfield demos that arrived during the week. Riding new models is always fun, but riding new models from a brand that’s new to Motoworks is something that doesn’t come along very often. I arrived at Motoworks about 7:45 AM and Grant, our Sales Manager, was already there with a trio of Enfields shining in the morning sun. We’d be riding two Continental GTs and a Bullet 500 for the day with an eye toward getting to know these new additions to the Motoworks showroom. On paper, these bikes are perfect for new riders, people moving up from scooters to motorcycles, and folks who are simply looking for something more old fashioned than the typical modern motorcycle. Yet “on paper” is never the whole story. 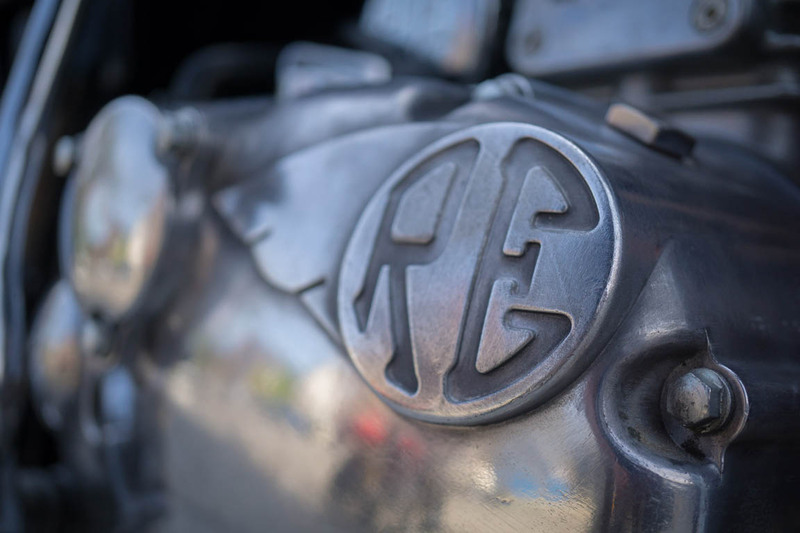 It was time to find out for ourselves just what Royal Enfield was all about 115 years after building their first bike. 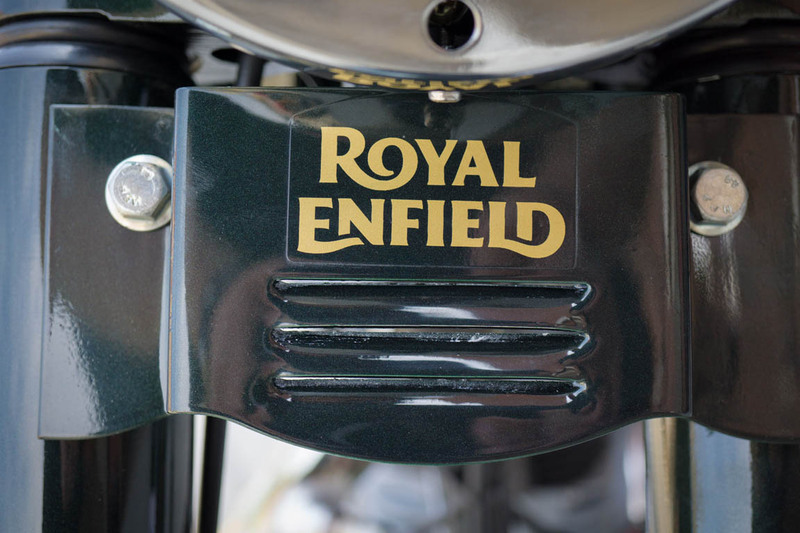 The Royal Enfields we’re carrying are really one motorcycle with a handful of important variations. The Royal Enfield Bullet 500 is the underlying platform for all of the bikes that Enfield sells here in The States. 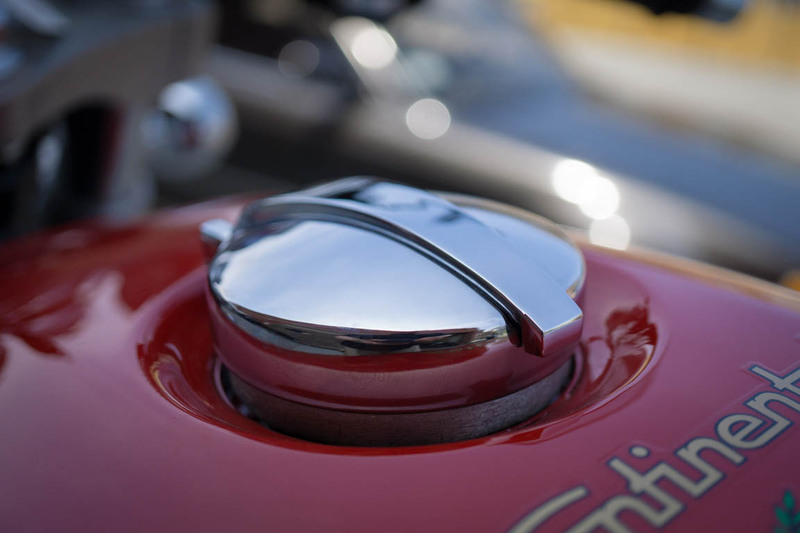 While it’s come in several shapes and sizes over the years, the Bullet is actually the longest-running continuously-produced motorcycle model in history. The modern Bullet’s engine is a 499cc, single cylinder, air-cooled thumper with electronic fuel injection. It makes just shy of 30 hp, which at first seems low for a 500-class motorcycle. That is, until you consider that it’s churning out 30 lb-ft of torque at just 4,000 rpm. While this certainly doesn’t make the Bullet a fast motorcycle by modern standards, it can more than get out of its own way. Best of all, that torquey engine character is part of what makes it such a relaxed, beginner-friendly bike to ride. The Bullet 500 comes in Forest Green and Black in its base form, plus four Classic models, which are basically like special additions for the Bullet. 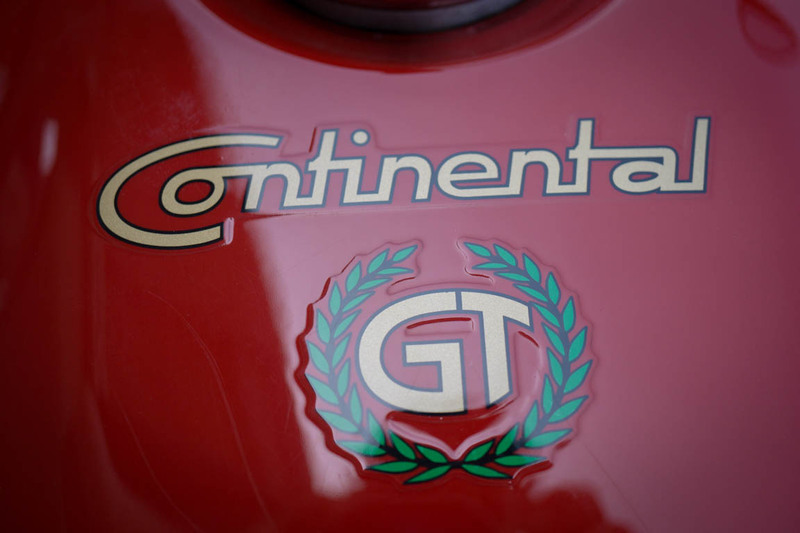 Yet it’s the third variation on the Bullet, the Continental GT, that has many people the most excited. This from-the-factory cafe racer version of the Enfield boasts not just a racier configuration in terms of its tank shape, its clip-on style handlebars, and its rear set foot controls. The Continental GT also features a more powerful, more refined 535cc version of the Bullet engine, which adds 2 hp to the engine’s output and a bit more torque as well. 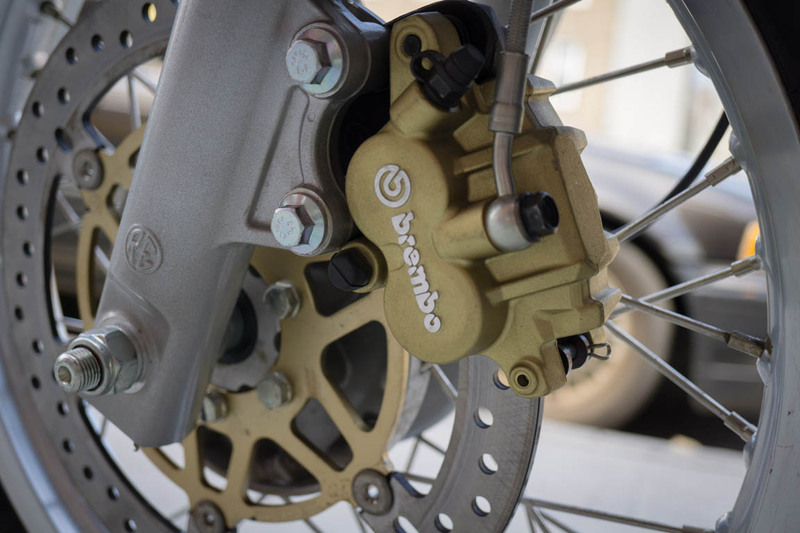 The Continental GT also features Brembo brakes (including a disk brake on the rear wheel) and upgraded suspension. 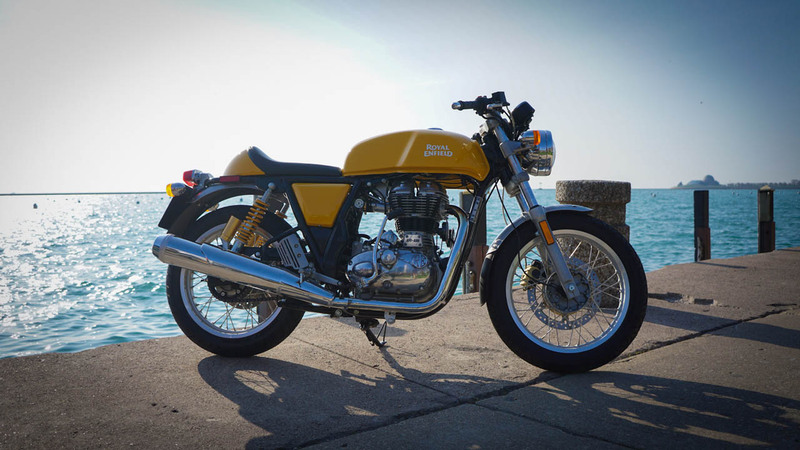 Last year the Continental GT helped push Royal Enfield to an impressive milestone. For the first time, Royal Enfield outsold Harley Davidson worldwide. Just stop and think about that for a second. 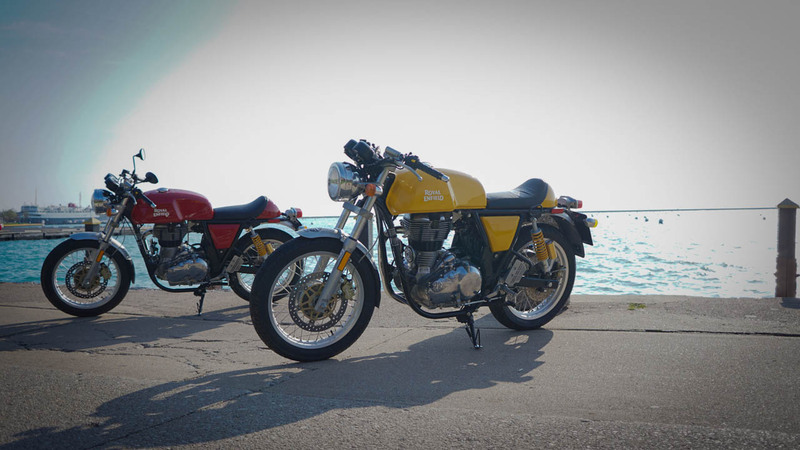 For our Sunday ride, we had a pair of Continental GTs and a standard Bullet 500. They’d prove a nice comparison to each other as we set off into the brisk spring morning. From the moment I swung a leg over the Bullet 500, what struck me was just how old-fashioned the bike feels. It’s conventional. It’s purposefully unrefined. It’s as though I’d traveled back in time to the mid ’70s and picked up a motorcycle brand new off the factory floor. That might not sound appealing to some, but that’s okay. That’s simply not who this bike is for. This feeling of timelessness was only reinforced as I turned the key and fired the bike to life. 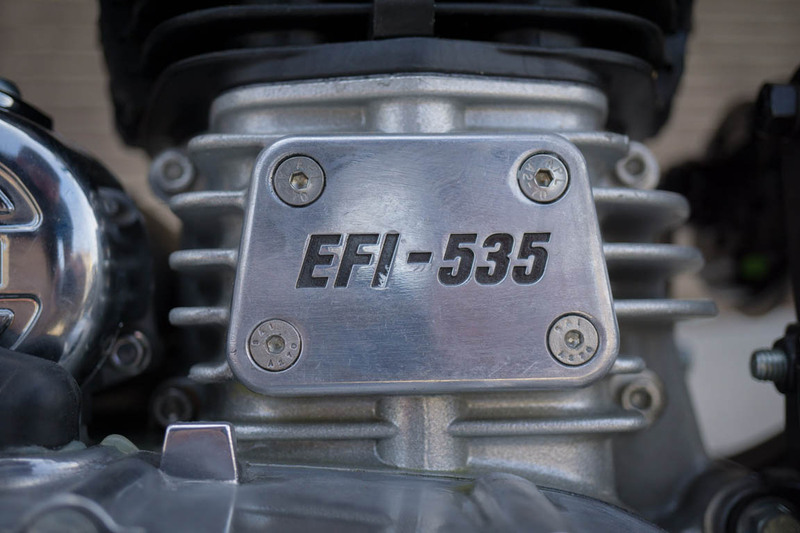 That particular Enfield was the only EFI bike I’ve ever encountered that actually needed a little bit of throttle to get started. It was as thought the bike felt nostalgic for its long lost carburetor. It would have been annoying were it not so charmingly in-character for this brand new bike with an old soul. 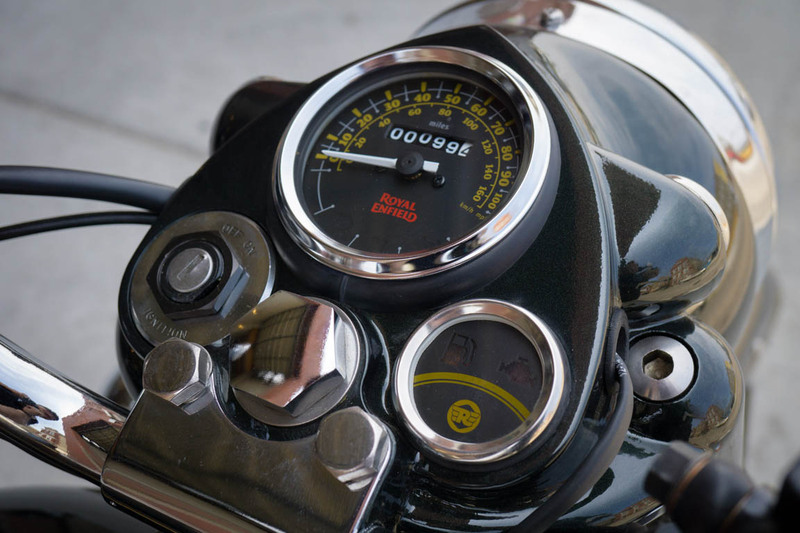 In my opinion, there is one key aspect to a motorcycle that defines whether or not it’s beginner-friendly, and that’s how easy it is to set off from a stop in first gear. If the engine needs a lot of revs, or the clutch engagement is too abrupt, it can be really tough to get the hang of pulling away. I’m happy to report that thanks to its torquey little engine and simple, cable-driven clutch, the Enfield was very easy to get going. Any revs at all were plenty to keep from stalling out, and the clutch engagement was nice and forgiving. Johnny and Grant pulled away on the Continental GTs while I followed on the Bullet 500. Our route would start off by snaking our way through Pilsen, down Damen and onto Hwy 55 toward downtown Chicago. The Bullet made easy work of the city streets. The only tricky thing was getting used to the engine’s torque curve — not because it was bad, but because it’s so different from the bikes I’m used to riding. The bike starts making usable grunt at about 2,000 RPMs and that grunt continues up to peak torque around 4,000 RPMs. In practical terms, it means that I had to ride my Enfield through the gears a little differently than I would for a typical bike of this size. 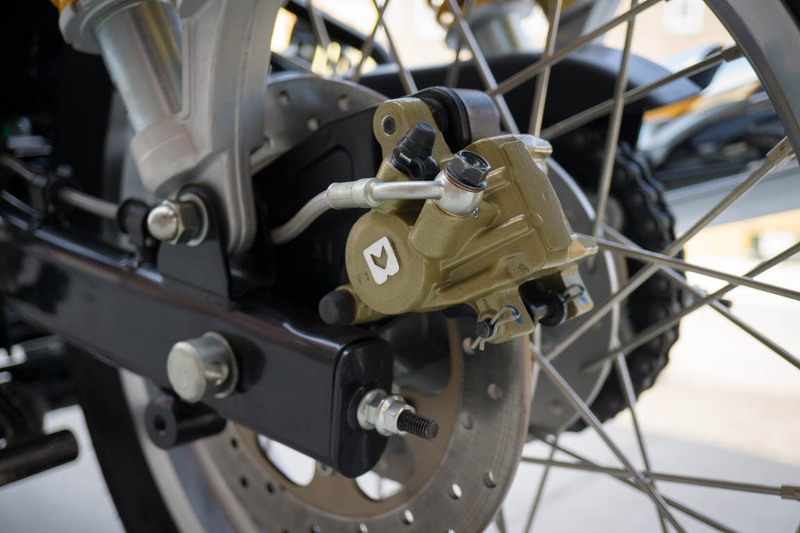 Where most bikes these days have close-ratio gears and are designed for you to wring them out pretty good between gear shifts, the Enfield is content to just “plomp plomp” along at 3,000 RPM a gear higher than it seems like it ought to be. Add to that the widely differing gear ratios in the transmission, and what I was left with was a motorcycle that simply wanted to be ridden a little differently. First gear is pretty normal and short, making the bike eager and easy to set off from the line, but second gear is actually really tall. I found that for pretty much all riding below 35 mph, second was the correct gear. 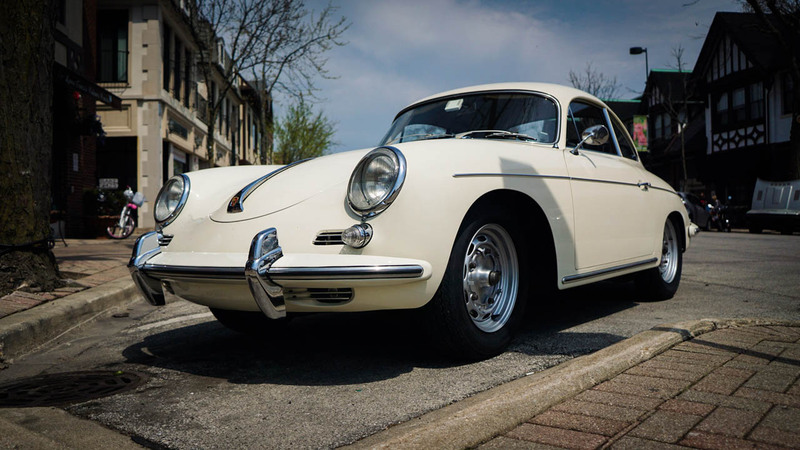 Low and slow, the engine’s torque would just climb over any slow speed maneuvers, but there were still plenty of revs left for more spirited zipping through city traffic. Until I figured this out, I kept looking for a gear between first and second, but all I found was neutral. I’d swear I was in third gear from how the bike felt and how fast I was going, but sure enough, I’d be in second. None of this detracted from the bike’s character at all. It only reinforced the Bullet’s old-fashioned nature. As we throttled up and onto Hwy 55 toward downtown, the on ramp gave me my first sense of the Enfield at speed. While not sophisticated in the slightest, the suspension and overall balance of the Bullet were very affable. Steering weight was slightly on the heavier side, but that just helped the bike feel stable the faster I went. We zipped down Hwy 55 and I found the the Bullet cruised very comfortably at an indicated 65 mph. It had a little power left at that speed, but not much. Once again, I found that even for basic passing, the Enfield engine preferred to keep its revs lower, so I just kept the bike in 5th gear unless traffic slowed and a lower gear actually made sense. The Enfield is definitely not a freeway bike, though. It’ll cruise at 65 mph, but ran out of steam at 75 mph. This is definitely one of those bikes where a good tuck can make the difference between passing that car and not. Nothing wrong with that, though. If you want to go fast, we have a lot of options for you at Motoworks. Yet if you want to go a little slower and actually enjoy yourself, that’s a shorter list, truth be told, and funny enough, the Enfield is at the top. This thought would be a consistent theme in our riding the rest of the day. The Bullet and Continental GT alike were both really easy to ride. They’re forgiving. They’ll build up a decent head of steam for riding quickly. They turn well, stop well and don’t do anything twitchy or unexpected. Yet because they’re so old-fashioned, they aren’t dialed in the way a truly modern bike is. In the best way, they’re a little bit sloppy. This meant that in order to get that last 20% of capability out of the bike, I had to ride it well. I had to work with the machine — had to pilot it, not just command it at the handlebars and expect it to obey. I couldn’t just twist the throttle and dump the clutch. I couldn’t just lazily hip-ride it into curves. Behind the bike’s forgiving nature was a hidden layer of capability that only a little bit of riding skill and focus could unlock. 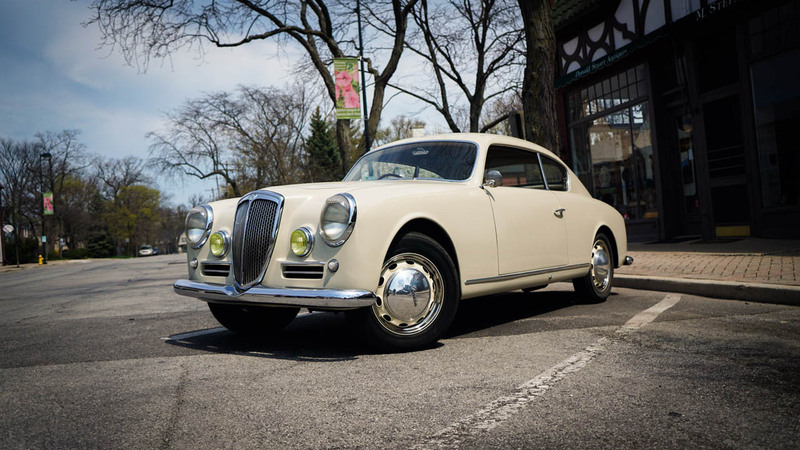 This mix of old fashioned character, a basic forgiving nature, and these little gems of capability that you could only access with a little bit of work all combined into a nebulous quality I can only describe as charm. Our first bike switch came about half way up our northern course on Lakeshore Drive. I switched the Bullet 500 out for Johnny’s red Continental GT. The first thing I noticed was the ergonomics. They’re not worse, but they are different. 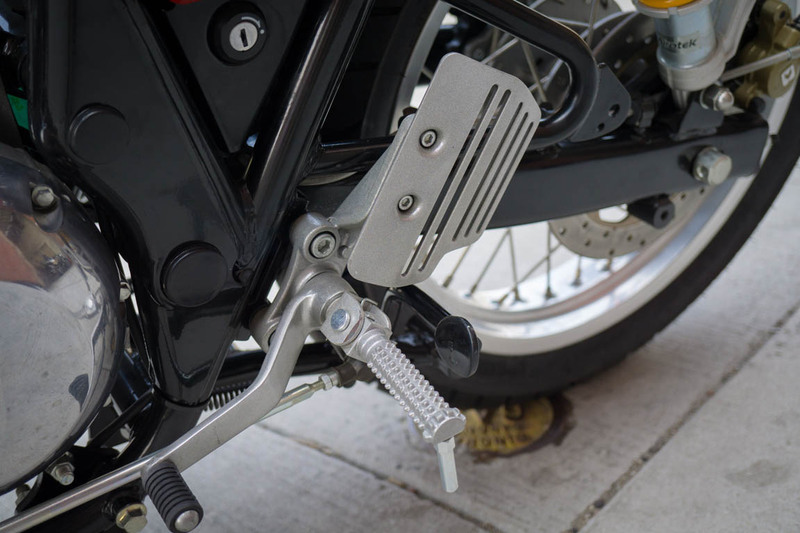 The GT has the typical cafe racer setup of low, clip-on handlebars and rear-set foot controls for the shifter and rear brake. I’m 6’3, so this arrangement is always a little cramped for me, but the GT was still rideable, even at my height. For normals, it’ll be fine. Beyond the riding position, what I noticed immediately was that the Continental GT felt noticeably more refined than the Bullet 500. The power band was just a little sweeter, it pulled just a little harder, and its upgraded suspension made its riding dynamics just a little tighter. Yet for all its refinements, it hasn’t lost its old-fashioned character, and if you ask me, that’s a good thing. I imagine that most folks will be drawn to the GT for its looks, which is understandable. They’ll be rewarded with a slightly better bike, at the cost of a slightly more aggressive riding position. For me personally, the more aggressive riding position of the Continental GT had me grateful to switch back to the Bullet 500 at our next stop. I’m a giant though. Your comfort is sure to vary. 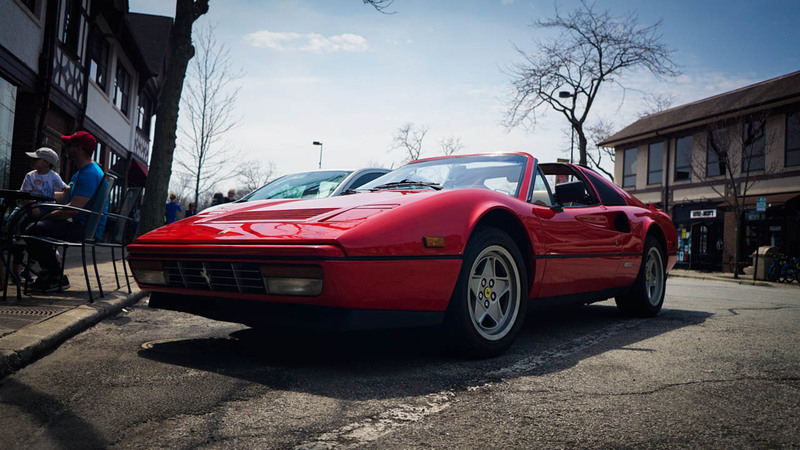 Our route north past Lakeshore Drive was the typical Chicago slow cruise up Sheridan Road. 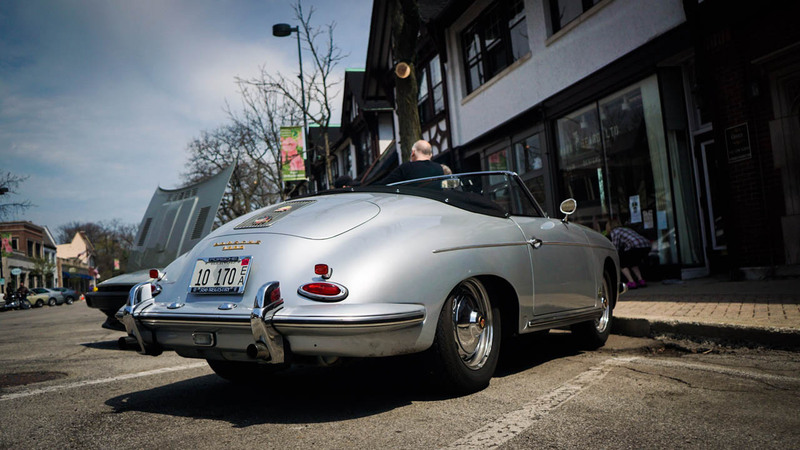 We stopped in Wilmette for caffeine before heading further north to Full Moon to catch the Sunday regulars and snag some breakfast. We were an instant hit with our pair of brightly colored Continental GTs and blacked out Bullet 500. Questions ranging from “What year is that?” to “Can I set on it?” were plentiful. 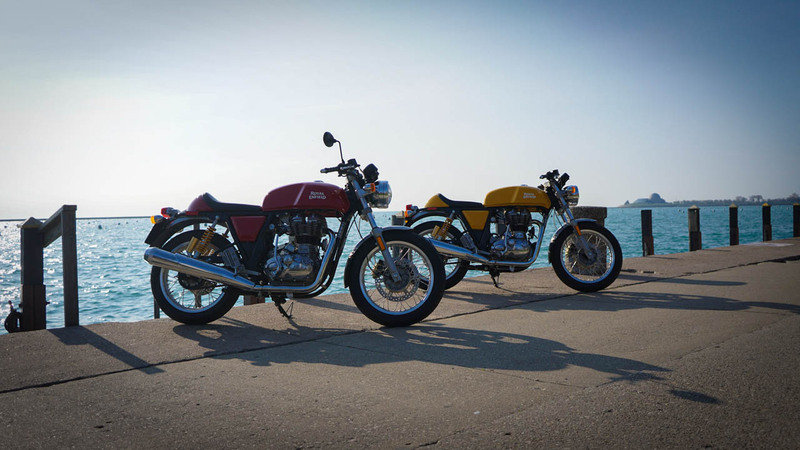 With Enfield only now returning to The States in such a coordinated way, and with our only just adding their bikes to our Chicago lineup, people were understandably curious. We’d been curious too, which is why we were out riding in the first place. We recounted the 30 miles or so we’d just done up Lakeshore and Sheridan Rd and I am pretty confident some of those folks will be scheduling a test ride in the near future to experience one of these three bikes for themselves. 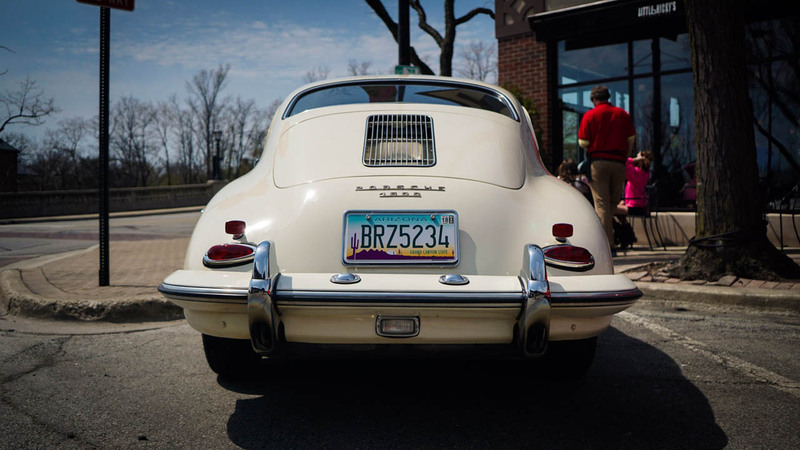 Our ultimate destination was FuelFed’s monthly Coffee & Classics event. 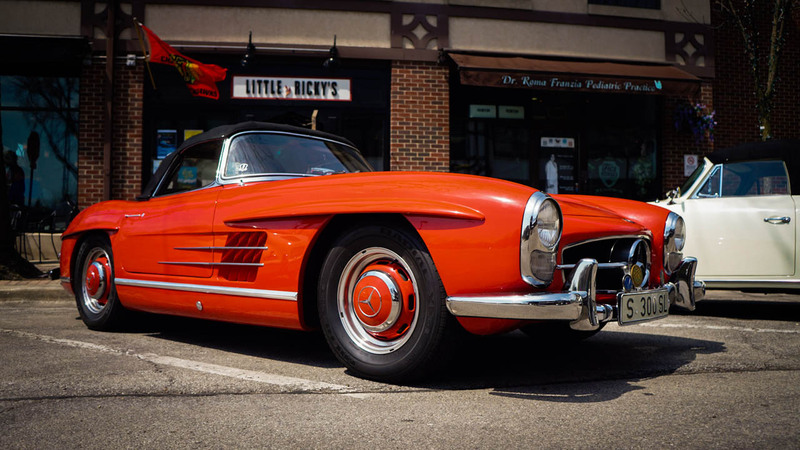 Typically held the last Sunday of the non-winter months, C&C is a great place to see exotic, antique and remarkable european vehicles in downtown Winetka, IL. 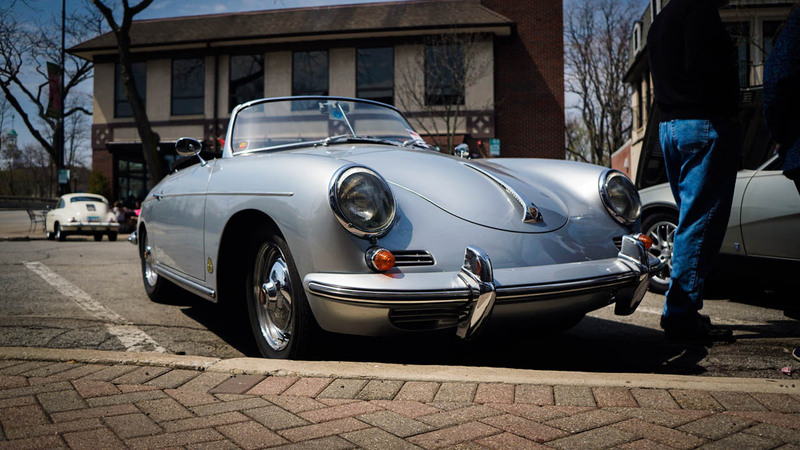 Not that a destination is really needed for a Sunday ride, but Coffee & Classics is a good one if you find yourself in the mood to head somewhere in particular. Our ride down from Full Moon to C&C let us experience a longer, faster stretch of Hwy 41 before returning to Sheridan Rd for more relaxed cruising. It’s that second kind of riding where the Enfield really shines. This is a backroads bike. It’s a Sunday cruiser. It’s a great bike for piddling around town. Sure, you can ride it quickly. You can ride it aggressively. It’s actually just as capable and just as fun as any midsize vintage bike would be, and that’s the thing really. The Enfield is a vintage bike delivered brand new from the factory here in 2016. It’s a window into a simpler time when riding a motorcycle was perhaps a bit more engrossing, and riding it well required a bit more skill and attention. There’s no ABS or traction control, but there’s also not enough power or aggressive handling to really warrant those modern systems. Yet the Enfields are modern where they need to be. I’d happily trade in all my carburetors on simple fuel injection. In the end, the Enfield is just a motorcycle — an honest, unassuming, basic, charming motorcycle. I can easily imagine mounting up a pair of leather saddle bags and just setting off on a back roads tour of America. Nothing fancy. Nothing complicated. Just a simple bike and the simple joy of the wind on your body, the air in your nose, and the landscape gliding by while that thumpy little engine just plods along underneath you. It’s a romantic picture that’s a little tougher to conjure on most modern bikes, despite their being arguably “better” in almost every way. That’s okay though. Better isn’t always, well, better. Oftentimes simple is better. As I look back on my own riding history, I can’t help but wish the Enfield had been my first motorcycle. It’s easy and approachable, yet for all the things it rewards in being ridden well, I feel like it would have been a great teacher. 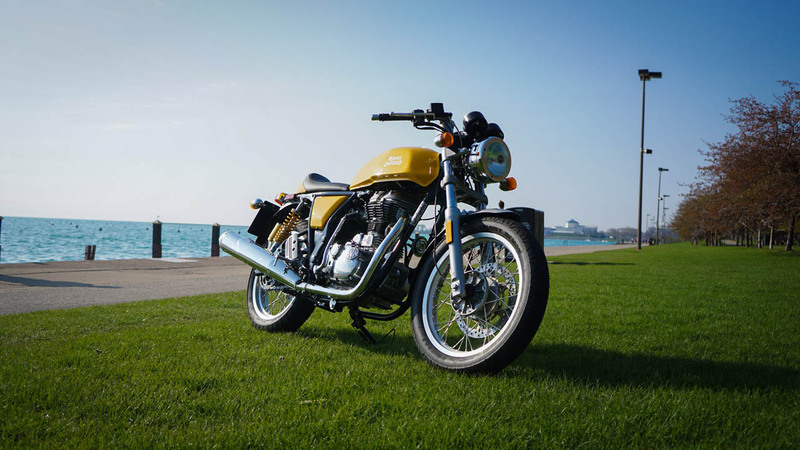 Now that the Bullet 500 and the Continental GT are available here in Chicago, I have a feeling a lot of people are going to get that great first bike experience I didn’t quite get. Good for them, and good for Royal Enfield for being so delightfully old fashioned. 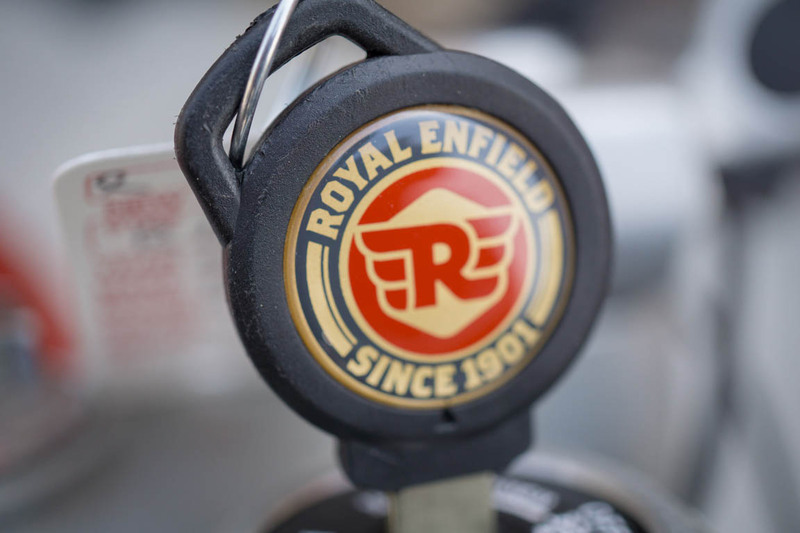 Get the wheels turning: Schedule a test ride on a new Royal Enfield.